The blood carries two gases, oxygen and carbon dioxide. Oxygen is required in many of the body's chemical reactions that transduce energy; carbon dioxide is a waste product of this metabolic activity. The capacity of the blood to transport oxygen and carbon dioxide as dissolved gases in solution is inadequate to cope with the metabolic demands of the body (0.3ml of oxygen is carried per 100ml of blood at normal inspired pressures of oxygen while dissolved carbon dioxide levels are only 2.8ml per 100ml of blood). Instead, other mechanisms are adopted to facilitate gas transport. Haemoglobin is the molecule which is employed by the blood to carry oxygen. One gram of haemoglobin can carry 1.34ml of oxygen. The normal concentration of haemoglobin in the blood is at least 11.5g/100ml in females and at least 13g/100ml in males. Thus the oxygen transporting ability of haemoglobin far surpasses simple dissolving of oxygen. Haemoglobin is composed of two parts, haem and globin. Haem is a prostethic group that is formed by a porphyrin ring in which a molecule of iron in the ferrous state is housed. This iron molecule binds oxygen. 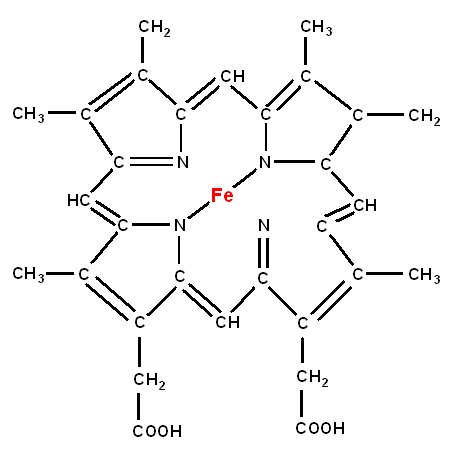 If the iron becomes the ferric form (Fe3+) it cannot bind oxygen. This form of haemoglobin is known as methaemoglobin. The enzyme methaemoblobin reductase reduces ferric iron back to the ferrous form if the iron in haemoglobin becomes pathologically oxidised. Globin is the protein component of the haemoglobin molecule. The normal form of haemoglobin is a tetramer which is composed of two alpha chains and two beta chains. One molecule of haem is bound to each of these four chains, such that one molecule of haemoglobin contains four haem elements and can therefore bind four molecules of oxygen. The alpha chain has 141 amino acids and the beta chain possesses 146 amino acids. Not all haemoglobin molecules adopt the alpha-2, beta-2 configuration (haemoglobin A). Around 1.5-3.5% of haemoglobin molecules have delta chain in place of the beta (haemoglobin A2), while a small minority of haemoglobin molecules in adults retain the form of fetal haemoglobin (haemoglobin F in which a gamma chain is used instead of the beta chain). Abnormal variants exist, such as those of sickle cell disease and the thalassaemias. Each molecule of haemoglobin can bind four molecules of oxygen. The binding of the first molecule of oxygen causes a conformational change in the shape of the haemoglobin molecule which facilitates the binding of the other three molecules of oxygen. Conversely, when a haemoglobin molecule is fully loaded with oxygen, the release of the first molecule of oxygen is the most resisted (this is sometimes described using the analogy of a 2x2 sheet of postage stamps). The degree to which the binding sites of haemoglobin are saturated with oxygen depends upon the partial pressure of oxygen to which the blood is exposed. If pressure is plotted on the X axis and percentage saturation on the Y axis, the graph has four key points. The nature of the binding and release of oxygen to and from haemoglobin means that in the lung haemoglobin avidly binds oxygen. By the time the blood reaches the tissues and the partial pressure of oxygen has dropped the circumstances favour the release of oxygen from the haemoglobin. 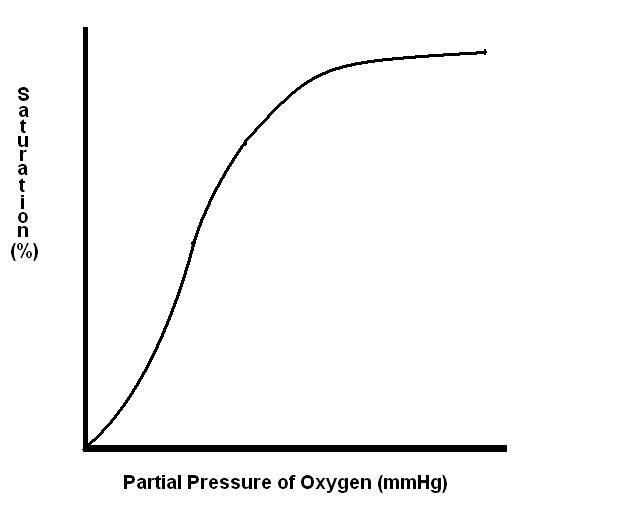 The position of oxygen binding curve of haemoglobin is not fixed. In the presence of a high partial pressure of carbon dioxide the curve is shifted to the right. This means that at a given partial pressure of oyxgen haemoglobin has a lower affinity for oxygen and therefore is less reluctant to release oxygen (the Bohr effect). This is the situation that is desirable in the tissues, especially those which have a high carbon dioxide level due to high metabolic activity. 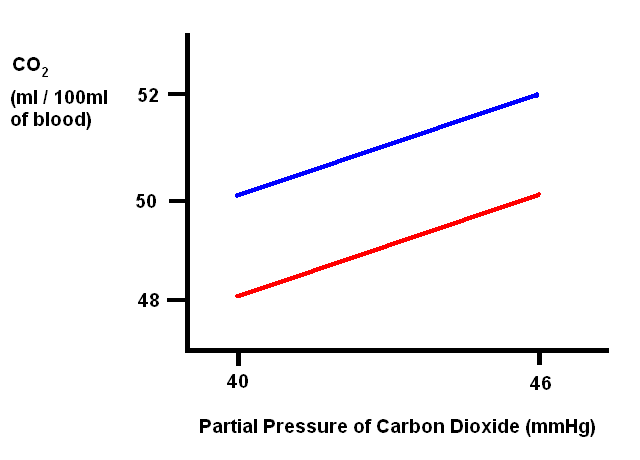 A low pH has a similar effect to a raised carbon dioxide level on the oxygen dissociation curve. A low pH (high hydrogen ion content) will reflect increased metabolic activity and therefore an increased oxygen demand. The dissociation curve also shifts to the right with an elevation of temperature. The substance 2,3-diphosphoglycerate is synthesised by red cells as part of their anaerobic metabolism. It moves the dissociation curve to the right by binding to the beta chains of haemoglobin. In the absence of 2,3-DPG the curve shifts to the left and haemoglobin becomes reluctant to surrender its oxygen. The significance is encountered in donated blood which becomes unusable after about one week because the 2,3-DPG levels have fallen so low that haemoglobin retains oxygen too avidly to pass it to the tissues at adequate levels. Myoglobin is another oxygen-binding molecule and is found in muscle. Cetaceans and other acquatic mammals possess very high quantities of myoglobin in order to allow them to hold their breath under water for long periods. Myoglobin is composed of a single polypeptide chain to which is attached one haem group. The monomeric nature of the molecule means that myoglobin does not manifest the co-operative binding of oxygen that haemoglobin does and the oxygen dissociation curve for myoglobin is therefore much steeper. Myoglobin only releases oxygen at very low partial pressures of oxygen. The carriage of carbon dioxide in the blood is more complex than that of oxygen. The bulk (90%) of the carbon dioxide is transported by erythrocytes. Around 60-70% of the total carbon dioxide load in the blood is conveyed in the form of carbonic acid and bicarbonate ions in the cytoplasm of erythrocytes. The presence of the enzyme carbonic anhydrase in erythrocytes is vital to this process because the natural equilibrium position for the reaction is normally far to the right. In addition, the hydrogen ions generated in the dissociation of carbonic acid into its component ions are buffered by the deoxygenated form of haemoglobin; levels of deoxygenated haemoglobin tend to be high when the blood has discharged its oxygen and taken up carbon dioxide from the tissues. This buffering of hydrogen ions pulls the equation to the left. A further 20-30% of the total blood load of carbon dixoide is transported in the form of carbaminohaemoglobin, in which carbon dioxide is bound to NH2 groups of haemoglobin. The remaining 10% of the carbon dioxide load is borne by the plasma and most of this is in the form of carbamino compounds on proteins. Plasma does not possess the same carbonic acid processing systems as erythrocytes, so little carbon dioxide is carried in this form in the plasma. Directly dissolved carbon dioxide also accounts for only a small quantity of the total load. The fact that the majority of carbon dioxide is carried by erythrocytes and that the transportation capacity is greater in deoxygenated blood (deoxygenated haemoglobin binds carbon dioxide better than oxygenated haemoglobin) means that the dissociation graph for carbon dioxide varies depending on the oxygen saturation of haemoglobin. The red line indicates the dissociation for haemoglobin that is 98% saturated with oxygen, as occurs in the lungs. The blue lines denotes the dissociation for haemoglobin that is 75% saturated with oxygen, as is the case in venous blood. The lungs are the site of gas transfer between the blood and the atmosphere. Oxygen diffuses from the air in the alveoli into the blood in the pulmonary capillaries while carbon dioxide moves in the opposite direction. The alveolar wall is as thin as possible in order to maximise the rate of diffusion that occurs. Diseases that cause the wall of the alveoli to become thickened impair this diffusion. Carbon dioxide diffuses better than oxygen because it has a higher molecular weight. For this reason any disease that impairs lung function will typically cause hypoxia before hypercapnia. The middle zone of the lungs is the place of optimum gas exchange. Towards the top of the lungs ventilation is highest but blood flow is lowest, due to gravity. Conversely, at the base of the lungs blood flow is good but ventilation is poorest. Approximately midway along the lungs the two curves intersect. The lung attempts to shunt blood flow to well ventilated areas using autoregulation which is adapted in the pulmonary arterioles to cause vasoconstriction in response to a low level of oxygen and vasodilatation in response to a high level of oxygen (this is the opposite to the usual behaviour of autoregulation). Although the partial pressure of oxygen in the air is around 150-160mmHg, in the air in alveoli it is only 100mmHg. This is because alveolar air contains more carbon dioxide and water vapour than atmospheric air and these two components lower the percentage of the air that is formed by oxygen and thus decrease its partial pressure.